Morgans’ five top large-cap picks for September, Chris Stott shares some overheated sectors, Giselle Roux from Escala Partners says yield stocks are overpriced, and nine top-performing LICs. Here are four things you should read this weekend. How far can the gold bull market run? This chart demonstrates just how supportive current rates are for a robust gold price. It shows what the historical annual gold performance (y-axis) has been, during a range of different ‘real rate’ levels (x-axis). 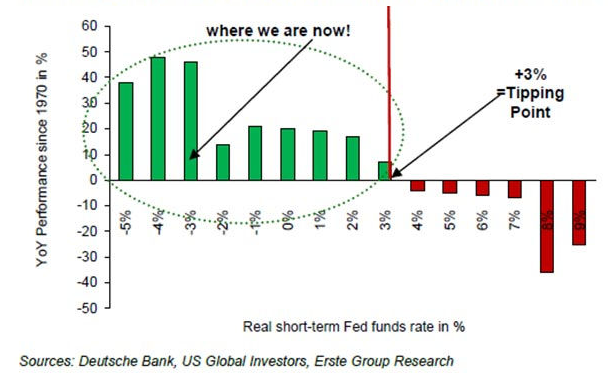 The chart infers that US real rates would need to be 600 basis points higher than they are now before gold would stop rising.